It must be said that Charlottesville is a self-consciously liberal bubble—a blue dot in a red state (barring Northern Virginia) in which students routinely volunteer for charitable causes, refugees from across the globe are a growing presence, and where the City Council, in March 2017, voted to remove two imposing monuments to the southern secessionism that was the Civil War. Ironically, this act, meant to signal the city’s progressivism, has, instead, underscored the persistence of racism in the nation and in Charlottesville. If Barack Obama’s election in 2008 falsely raised hopes that the U.S. had become a post-racial society, the torchlight march, anti-Semitic and racist chants, and racially inspired violence, culminating in murder, of the weekend of August 11-12, 2017, in Charlottesville, definitively drove a stake through the heart of the nation’s post-racial fantasies. But perhaps this stake has only nicked Charlottesville since it has raised the uncomfortable question, not easily embraced by city residents, whether local White supremacists, and not just out-of-city hatemongers, participated in the August chaos. In fact, far from merely participating, at least two of the organizers of the August rally are known to have local connections and used these to focus supremacist rage against the city and the University of Virginia. The goal was to use the statues of Robert E. Lee and Thomas “Stonewall” Jackson to make a bold political statement: that the marginalization of far-right ideas and goals because of the development of powerful post-civil rights norms of public tolerance has ended. The political winds have shifted in the movement’s favor, aided by approval at the highest political levels. The movement’s moment in the sun has arrived and its agenda, now legitimized, has become part of normal politics. 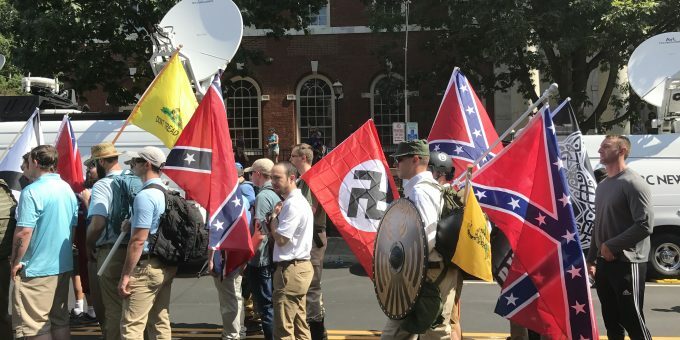 To facilitate this normalization, it was necessary to “unite the right” by overcoming the tendency of supremacist groups to pursue specific agendas, and to focus on the fact that they have core interests and common enemies—the creation of a White ethno-state shorn of Jews, people of color, and post-civil rights era ideas that the far-right perceives as antithetical to a “pure” White polity. Clearly, a precedent for extreme racism exists in the city, but one also needs to take seriously the city’s claim that it has become a much more tolerant place. The outstanding characteristic of modern-day racism is its complexity. Rather than disappearing, as some pundits would have it, racism co-exists with apparent positive changes in racial attitudes, takes many forms, operates culturally through colorblindness, and persists in structures that disproportionately harm people of color without leaving fingerprints. Also, increasingly, in backlash against ever-increasing immigrant-fueled diversity, racism is reverting to its brutal, atavistic form. In the case of Charlottesville, all this means a conscious effort in some institutional spheres to make amends for past racism (e.g. the March 2017 City Council decision on monuments), opprobrium at public acts of racism, and a deep investment in the idea that Charlottesville is a friendly, diverse, welcoming city. Although some of this might only be image management, it also has substance. City residents were deeply shocked at the August violence and astounded that it could happen in Charlottesville. Also lending substance to the city’s claim to tolerance is the fact that the growing Hispanic population, which contains large numbers of undocumented individuals, feels welcomed in the city. In contrast, in recent years some Northern Virginia counties have launched anti-Hispanic campaigns to drive out these immigrants. Nonetheless, racism persists in the city but a liberal ethos of tolerance can paper this over. Colorblindness redux. Although disturbing to see, the real danger does not lie with White supremacists. Despite their penchant for violence, one does not routinely encounter such individuals. Of greater concern is the ordinary everyday racism of American life, whether living in rural or urban areas, large cities or small: micro-aggressions directed at people of color; casual slurs; the persistent patrolling of Black males—UVA students included—sometimes leading to brutal police interactions; patterns of exclusion from social life; and though Black-White segregation is noticeably lower than a place such as, say, New York City (52.4 to 84.4 using the Index of Segregation), one still sees poverty, crime, and less desirable housing and amenities falling hardest on African Americans and Hispanics. A few years ago, a potential graduate student recruit described Charlottesville to the author as being “Pleasantville.” In many ways (e.g. the physical surroundings) it certainly is, but this perception also varies by one’s standing in the economic and racial hierarchy, and to many people of color the verdict on Charlottesville is a more ambivalent one. Milton Vickerman is in the sociology department at the University of Virginia. He is the author of The Problem of Post-Racialism.